As mentioned in a previous post, I’m working on Etcher, an Electron application to burn IMG/ISO images to removable drives in all major operating systems. Since the application needs to get write permissions over devices, we present a nice “elevation” dialog at the start of the application to run the application as root. This file is in charge of exposing Electron’s public APIs, exporting Node.js bindings to global, and generally initialising the renderer context. Failing to load this file means that we can’t require() any modules nor do anything meaningful, leading the app to a broken state. 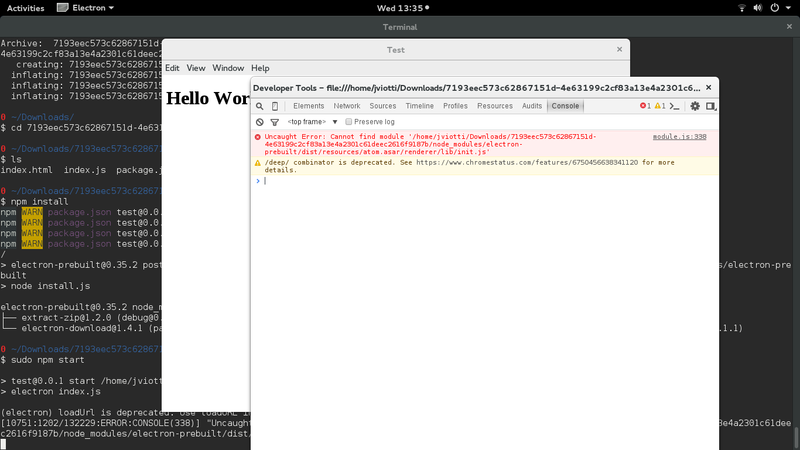 Notice the bug only manifests itself when running an Electron application on GNU/Linux as root. Running it with normal privileges works flawlessly. After a debugging session with the Electron codebase, the root of the error is file_.IsValid(), a utility function from Chromium, returning -1 on atom.asar in atom/common/asar/archive.cc's Archive::Init(). // Converts an error value to a human-readable form. Used for logging. By combining these two functions, the error becomes FILE_ERROR_ACCESS_DENIED. Why access denied? We’re running the application as the superuser, who has access on everything, and we don’t get the error when running as a normal user. Notice that the operation actually succeds a couple of times before the access denied error. After some experimentation with getuid(), we can see the operation works from Electron’s main thread, but fails from renderer threads. // Since we just forked, we are single threaded. Electron makes use of an awesome project called libchromiumcontent, which provides a shared library of Chromium and all its dependencies. The project contains a set of diff patches that are applied on Chromium’s source during the build phase, which is a perfect place for the fix. I’ll write a blog post on how to submit a patch to libchromiumcontent and test your changes with Electron locally, stay tuned! The fix described above landed in Electron v0.36.8.